Someone has aptly said that the real adventure of life is to live the life of your dreams. Even I had a dream, a special dream, buried deep inside my heart, bouncing around in it for years. I thought to myself, “now or never” and decided to transform my dream into reality. 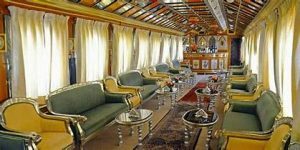 I always wanted to experience the “lifestyle of raja-maharajas” and Palace on Wheels, rated amongst the top ten luxury trains of the world, was certainly the best bet for me. Elated, I and my friend Shivani boarded Palace on Wheels from Delhi Safdarjung Railway Station on the Wednesday evening. This luxury train offers 8 days/7 nights tour to various fascinating destinations of North India, and that too in a royal style. The train covers the following destinations- Jaipur, Jaisalmer, Jodhpur, at Sawai Madhopur, Chittaurgarh, Ranthambore National Park Udaipur, Keoladeo National Park in Bharatpur, Fatehpur Sikri and Taj Mahal in Agra. And then back to Delhi. Once the personal railway coaches of the raja-maharajas of the bygone era, Palace on Wheel is truly the epitome of royalty and luxury. With royal, traditional and stunning interiors, state-of-the-art facilities and Khidmatgars at your service, you surely get the royal feel. During my journey in the train I enjoyed both the king-like hospitality and attractions of bewitching tourist destinations. We also enjoyed dance and music performances and puppet shows, a rejuvenating experience. I felt as if I has travelled back in time to the glorious era of Raja-Maharajas. An exotic array of dishes were available to tantalize the taste buds. The traditional Rajasthani dishes were lip-smacking. Seeing the menu consisting of amazing dishes, the “food-lover” inside me raised its ugly head and I without thinking about calories gorged on the food (although I was on dieting). I enjoyed every bit of my luxurious and enchanting journey on the Palace on Wheels. Lived my dream. Contented to the hilt. What a wonderful feeling it is! «Next Post Rajasthan In Its Royal Hues!